We absolutely LOVED Marrakech! As well as Essaouira and the Atlas Mountains!! We are so happy we were able to see all of those areas. They were all very unique in their own way. We wish we could of squeezed in one more day in Marrakech the city but time would not have allowed. Essaouira was so ancient feeling. We are very happy to have made that trip and see the Aragon area. The drive gave us a new perspective of the area too. The Atlas Mountains were so beautiful! We were SO happy to have gone there and take a hike. My husband LOVED that part of the trip. He wants to go back to hike the summit! Our guide there (forgetting his name!) – was absolutely fantastic too! All of our guides were absolutely wonderful. Truly enjoyed each and everyone of them. and of course Ahmed, our driver, was fantastic! So easy to talk to, very knowledgeable and very easy to travel with. We all learned a lot about different topics we brought up and Ahmed was very informative. We loved learning about the region and the Muslim religion. 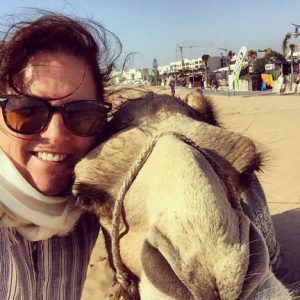 Traveling in Morocco was such a unique experience! I have and will continue to highly recommend it! My daughter who had been studying abroad all semester said it was her favorite city! Additionally, we really liked the Riad we stayed at. They gave us a fantastic room/duplex- which was wonderful. Their service was outstanding and their restaurants was the best food we had the entire time we were there. So I guess the best story I have is when my daughter and I experienced our first Hammam together. We had no idea at that point what to expect. The spa at our Riad was gorgeous so we were really excited! However, I don’t think my daughter understood that she was going to be naked in a room with her mother! Ha! but it was a bonding experience for sure! To learn that is it a weekly ritual of Muslim women and men was very interesting. The actual experience itself was so fantastic and cleansing feeling. We both loved it! The Riad did a wonderful job. It was so relaxing and indulging feeling. It was a definite unique memory of the trip! Hope this was helpful! and thank you for all your help with this wonderful experience!